Hey everyone! I have another great post by Jen from Frugal-Millennial.com for you today! This is a subject that's near and dear to me – my wife and I rented a room from her parents while I paid off my student loans. There are so many Millennials that are going through this right now, and it's way harder (and more embarrassing) than people on the outside think. A lot of young people that have been crushed by the student loan machine are staying home longer than they ever thought they would so that they can pay off their debt and be done with it. 1 out of 3 Millennials lives with their parents after finishing college. Many young people graduate with tens of thousands of dollars in student loan debt and struggle to make ends meet on entry-level salaries. Moving back home can allow them to pay off debt, build savings, and get back on their feet. Living with parents is a smart decision financially, but it’s not easy for anyone involved. You probably don’t want to live with your parents forever, and let’s face it – they were probably looking forward to being empty nesters. Becoming a “boomerang kid” – or living with one – generally isn’t part of anyone’s life plan. Unfortunately, life can take some unexpected turns. Having a game plan with a set “move out deadline” will help you and your parents to feel more positive about the situation. For example, you might tell them that you plan to live with them for two years until you have x amount of debt paid off and x amount of dollars in savings. Do your parents want you to pay rent? If so, how much? If not, do they still expect you to cover your own expenses, such as your groceries and gas? Would they like you to contribute to the grocery budget and eat meals with them, or would they prefer it if you purchase and cook your own food? Do you need to ask them for permission before you invite a friend or significant other over? These types of questions should be discussed in advance to prevent any future arguments or frustrations. It is much better to be proactive and to address beforehand rather than waiting until someone is upset about the way you handled one of these issues. 3. Set a cleaning schedule. One of the biggest challenges of living with anyone – a roommate, a spouse, a parent – is that different people have different expectations when it comes to cleaning. If you’re disorganized and hate cleaning, but your parents are neat freaks (or vice versa), you might drive each other crazy. Because your parents are doing you an enormous favor by allowing you to live with them as an adult, it’s appropriate for you to follow their expectations. Even if you feel like you’re doing your part and following their rules, they may still feel resentment and frustration if they perceive that you aren’t doing as much of the cleaning as they are. A good way to fix this issue is to implement a cleaning schedule. Have a meeting about it and agree on a plan for who will do what and on which days. Put it all on a calendar, and stick to the schedule. 4. Keep the communication open. Depending on your particular situation, it may be a good idea to have a monthly or weekly family meeting. This would be the perfect time to proactively discuss minor issues that arise before the issues spiral into bigger problems. It is much healthier to calmly communicate about issues early on, rather than to wait until the frustration builds and leads to disagreements. If you can keep the communication open, you can make the situation more pleasant for everyone involved. 5. Pay off debt and/or build savings. The purpose of living with your parents should be to improve your financial situation. If you’re saving money on rent, you should be able to put a large portion of your income toward repaying your debt or building savings. Don’t blow your money on things like eating out, going to bars, or other non-essentials. You don’t need to try to keep up with your friends or the “Joneses” (who might just be racking up credit card debt). 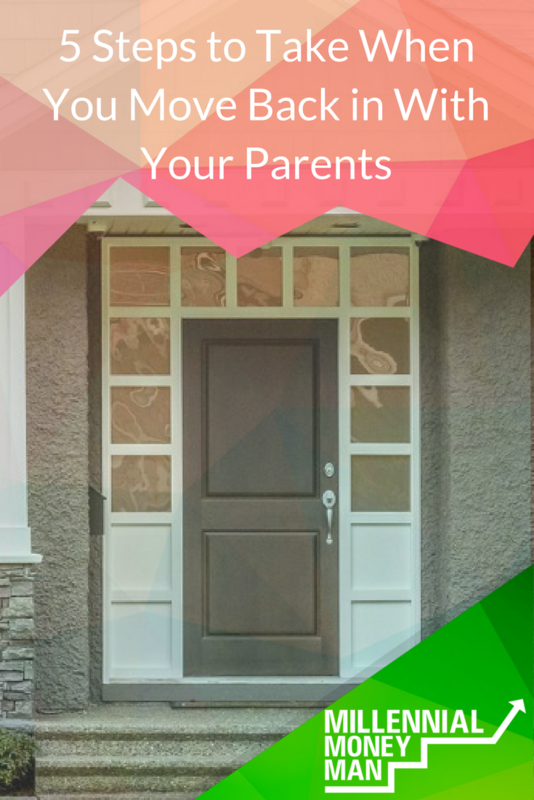 If you move back in with your parents after college, it’s important to have a game plan, understand the expectations, set a cleaning schedule, and keep the communication open. Living with family should be an enormous help with your financial situation, so you should pay off debt or save as much money as you possibly can. None of this is easy, so you should at least make it worthwhile! Is it a good idea for Millennials to move back home to pay off debt? Good advice all. I’m an old fart and have experienced this both ways. My wife and I moved my grandfather back in while he was battling cancer. The arrangement worked beautifully as my wife was his primary caretaker and took him to treatments while I worked (yes, I am blessed many times over to have found someone willing to do this). We shared some of the household expenses. Now that I have a teenager approaching college the option to stay home and go to school is on the table. She knows the only two options are working full-time or go to college. Floundering is not allowed. As long as she does one of those two things she will be expected to help out around the house in exchange for free room and board. When she graduates we will likely give her a deadline to find a career and move out on her own – maybe 12 months. I know this may sound harsh to some, but a parents role is to raise kids to stand on their own. We won’t be around forever to tend to them in the nest. We had a similar situation – my wife’s father had a terminal illness when we moved in that was just in the beginning stages. We were able to stay with them and really help as it progressed. Eventually, we had to move out though…too many hospice people coming in and out and it started to cause a lot of stress. Glad we got to do it and spend the extra time with him. Sometimes it is a win-win for all involved. If you can save money and take care of a seriously ill relative at the same time, it makes sense to do so. My parents loved having me at home, each time I moved back in with them. It will be the third or fourth time since college this coming Oct. ; because of living this way, it’s actually easier to spend time with friends. Living with my partner (“on our own”) the past two years has been somewhat isolating, contrary to popular belief. Oh that’s interesting! Never heard that side of it before. Great info! I don’t think there’s anything wrong with moving back in with your parents as long as you have a plan for how you’ll chip in at home and when you’re going to move out. Like Bobby has talked about, moving in with parents can be a huge money saver in order to pay off student loans. As long as you’re making progress toward your goals, I think it’s a great idea for many people. I like these tips. I think setting expectations and talking about the situation would help everyone. I probably would have considered moving back home (despite having no debt), but my parents didn’t live in the same city as I had a job offer, so it was a no-go regardless. I think that living with parents can be good or it can be bad; it kind of depends on the relationship. The biggest thing, IMO, is that the kids need to still BE and FEEL like they’re independent. You’re a grown up; act like it. Along those same lines, I think the expectation should be that the children are working (SOME job) and contribute in some way – be it through rent, groceries, chores, what have you. That’s always been my opinion – it doesn’t matter what the arrangement is…you have to contribute. I feel like the parents sacrifice more in these situations than the kids most of the time, so you have to provide as much value as possible. I agree. If someone isn’t working at all (and isn’t trying hard to find a job) or contributing in any way, it can turn into an unhealthy situation where the parents are enabling their son or daughter. Great advice. It can be awkward to be an adult under the same roof as your parents. My husband, son and I lived with my parents for about 3 months after we moved across the country but before we found/closed on our house. We knew it was temporary, which was helpful, and everything went smoothly, but it was an odd arrangement. Knowing the expectations and communication were key during those months! I totally agree – you gotta talk about that stuff up front! Makes everything so much smoother. It definitely has its awkward moments! Excellent recommendations. The key is to be very, very clear about boundaries, including move-in/move-out dates, payments, and household contributions. I almost moved back in with my dad after college, but it wasn’t for me personally. It can be an EXCELLENT way to improve your finances, though, if you have the option. I agree that it’s important to be very clear about boundaries and expectations! I think, in the right situations, that moving back in with your parents after college can be a great financial move. Being able to build up a cash reserve by saving on rent payments for 12 – 18 months can give you a huge step forward in your financial goals for your early 20s. Those funds could be used to pay down a part of or all of your student debt, become a down payment on a future rental property or give you the financial flexibility to start saving for your retirement from day 1. Definitely a lot of benefits IF you can get all of the details worked out beforehand. We moved out a few years ago, but it was something we still look back on and have some good memories of. I actually think this is one of the ways that history will look back and judge your generation as great. Millennials are learning how to be adaptive and resilient given their circumstances but it’s viewed negatively in our present time because it’s different. Keep it up! Haha dang Bruce I hope so! That’s a perspective I don’t hear very often! Thank you! My son has been living with us for the past few years while he saves up for a home. We live in an expensive metropolitan area so deposits on first homes aren’t small. He is now looking and has $50K for his down payment. I think we all feel really good about this. Yes, move back in! I was able to pay off 30k in 12 months making 48k. After that I saved up and bought my condo with cash at the age of 25. Take advantage of all opportunities presented and find the best in everything. It’s not easy, that’s for sure! My wife and I got caught between homes a few years ago and ended up renting a place from my in-laws. It was really nice for about a day and then we started stepping on each other’s toes. I like that you said to make a cleaning schedule. Setting boundaries and expectations early would help a lot! “It was nice for about a day” haha I can relate to that! It’s not easy, but I think setting expectations early on can help somewhat. I moved in with my parents right out of college for about 2 years. I ran my own restaurant so I was rarely home. It was more of a hotel situation. In return for free beer, my dad gave me a place to live haha! It was nice for me because I didn’t have to worry about maintenance of a place. I had no time for that. After I settled down and got more of a traditional job, I ended up buying a place with the money I made selling the business. Really worked out in the end, and I was lucky to have that as a living option.